Mike: Well, that’s a bit of a story. I’ve had the unique ‘opportunity’ to experience firsthand what it’s like to be in prison, and to experience the power of the practice from both sides — as an instructor, and as an inmate. After being caught up in a corporate legal action, I was convicted of a misdemeanor resulting in a nine-month prison sentence. The day I was sentenced, I made a commitment to use this experience to explore and deepen my practice. At first yoga was a tool for survival: to find calmness amid chaos, to surrender to this situation while maintaining a sense of optimism. In my cell, I practiced simple asana poses such as the warrior series and some Baptiste-influenced core work — nothing crazy or ‘weird.’ Inmates soon approached me to learn about these “crazy martial arts exercises.” They were attracted to the notion of getting a vigorous workout without equipment. Eventually, many of them came to understand that yoga could help strengthen their minds and develop disciplines for self-regulation. Thanks to a few sympathetic correctional officers, regular yoga classes started two weeks into my incarceration. This led to the introduction of guided meditations, which was a life-changing experience. You could literally see the lights go on for some of the inmates as they realized there could possibly be another way to live. Eventually, I was transferred in shackles in an armed prison bus to a prison camp where my practice continued to grow. I worked as a tutor for inmates who had a 5th grade or lower educational level. There were big, tough guys. Many were previously in gangs and deep into drug dealing. Befriending the ‘tough’ guys gave me street credibility, and provided an opportunity to introduce yoga to a much wider group. The practice quickly expanded from a basic asana practice to a comprehensive program, which included yoga for beginners, yoga for the back, Taoist yoga, Yoga Nidra (deep relaxation meditation), and workshops on non-violent communication. The universe works in mystical ways. I had the opportunity to return to the federal detention center to teach yoga — not as an inmate, but as a volunteer. As you can imagine, this has been such a rewarding experience on many levels. The criminal justice system fails to deal in any meaningful way with rehabilitation. The Judicial Council of California reports that approximately 65% of inmates will return to prison within the first three years of release. We need to do more to stop this destructive cycle. Inmates can themselves become agents for positive change, both inside the prison and upon their release. Many ex-offenders have turned their lives around through yoga, and by making a positive difference through work in their communities. It’s hard to put a price on this activity, but we know that our communities are better for it. Interestingly, the challenge is not with getting buy-in from wardens, as there has been a positive shift in the thinking within the correctional system towards providing mind/body programs. The challenge is working through the bureaucracy of getting access into the prison. It takes perseverance to navigate the many hurdles for clearance. Funding is a challenge since the prisons don’t pay for the classes, yet we need to make sure instructors are properly trained and able to travel to undesirable locations. Our yoga instructors get as much, or more, out of teaching in prisons as the inmates do. It is an incredibly rewarding experience, and a way to ‘pay it forward’ through Seva. It is, however, essential that anyone who goes into the prison system be trained to teach yoga in prisons. You also need to check your ego at the door! We follow the Prison Yoga Project’s proven mindfulness-based asana and meditation practice. There are instances in which otherwise good instructors teach yoga styles incompatible with trauma, with sadly negative results. It is imperative that yoga instructors take a trauma-informed approach to yoga, and get trained! While there are many excellent yoga teachers, most have not been specifically trained to address the triggers and logistics of dealing with people suffering from complex trauma and/or addiction. All of our instructors are yoga teachers who have received additional training and follow the Prison Yoga Project methodology, which has been proven over many years at San Quentin and numerous rehab centers. We work to make sure our classes are consistent with the participant’s current treatment modality. 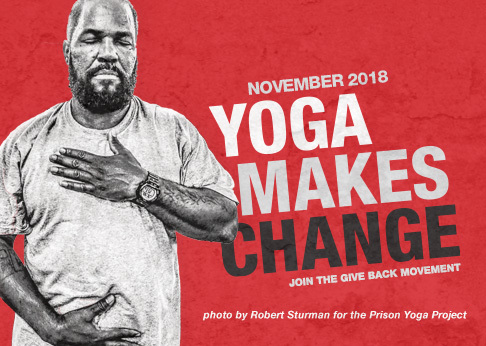 Help Give Back Yoga to put yoga and mindfulness guides in the hands of 1,000 prisoners this year by purchasing Prison Yoga Project’s powerful book, A Path for Healing and Recovery, for yourself or on behalf of a prisoner. This is an interview with Sara K. Schneider, who wrote about law enforcement in her book, “Art of Darkness: Ingenious Performances by Undercover Operatives, Con Men, and Others.” Yet she describes having had since her early 20s a “haunting” to work inside the prison system. Initially finding it hard to “break in,” she started teaching men in a post-release program on the west side of Chicago. A mindfulness teacher who’d been teaching in the Metropolitan Correctional Center (MCC) made introductions for her to teach the female minority residing in the federal prison in Chicago’s central Loop. Sara directed the MCC’s women’s yoga program, where she taught weekly from 2012 to 2014; and has recruited and trained other yoga teachers to teach both women and men inside the prison. In addition to being a yoga instructor, Sara is a playwright, professor, and performance ethnographer writing about body-based spiritual practices including, most recently, yoga in prisons. Sara can be reached at sks@thinkingdr.com. Rob: What have been some of the surprises of teaching yoga in the prison setting? When I started working with the women at the MCC, I imagined I’d be introducing yoga to women who had not had any prior experience with it. Not only did these women incarcerated in Chicago’s federal prison seem more comfortable and familiar with seeing yoga as a spiritual as well as a physical practice than sometimes do new students “on the outside,” but a few had already been practicing yoga before their incarceration. Many of the women who self-selected to join the yoga class were using their prison time in other ways to develop themselves spiritually. Another surprise was how the conventions of the yoga studio seemed to fall away. Some of those who were newer to yoga frequently saw the poses in a sexual light, and would break out into nervous laughter or giddy riffs on the poses that would take the group a while to recover from! I had to learn to go with the flow on that, to allow the laughter as a necessary part of coming to the practice from prison culture. It was important to channel that laughter so that it would be shared rather than aimed at one or another student, as might be common on the residential floor. How else did you have to adjust your expectations or adapt your teaching in the prison setting? I’m a vinyasa teacher who loves flowing and (yes) complex sequences. The inmate population is not necessarily invested in yoga choreography, nor is the average inmate in physical shape to be able to get much flow going, in part because prison life keeps the women quite inactive. While at the beginning I held to an idea of getting my new students into shape to be able to handle vinyasa, the MCC population was so transient that this wasn’t a realistic goal. Over time, my teaching shifted to focus on a couple of things: the first was giving the inmates a few simple breathing, mindfulness, and postural practices they could do on their own, in the spaces available to them, to enhance their ability to handle anxiety, depression, anger, and other troubling emotions they naturally experienced during the week. The second focus was trying to give the women an experience of positive female community. Sometimes my regular students wouldn’t come down to the chapel space for yoga because of infighting with other women on the floor they knew were planning to come; they just didn’t want to do yoga side by side with them. With only 20 or fewer female inmates in a facility of nearly 700, every woman got to know every other woman very well. In class, one of their favorite activities was to lay out the yoga mats right up against each other and to “roll.” It was actually a very gentle twist that would take all of us, in a very childlike way, from one side of the open chapel room to the other. We’d start face down, and initiate rolls onto our backs from the trailing hip and rolls onto our bellies from the trailing shoulder. The women loved teaching new students how to roll in this way and laughed and laughed together as they flopped onto their backs or onto their bellies. My sense was that it was rare for these women to enjoy the simple pleasure of their bodies in this communal way in their life on the residential floor. Plus we were doing fun spinal twists! Finally, I wanted them to have the protected space of a class and to have a Savasana (corpse pose) that offered a brief but complete release. These women are woken up with guards’ flashlights shone in their eyes early each morning, and had so little experience of real rest. They instantly understood Savasana as a space of deep, protected peace, yet it was often real work to ensure that no prison staffer interrupted them, as they did not necessarily buy into the vital importance of such rest. Are there ways in which your teaching in a prison has impacted your teaching on the outside, or your own practice? The fact of incarceration, as juxtaposed with the freedom inherent in yoga, was brought home powerfully to me on a summer’s evening when we had class on the roof of the prison, instead of in the chapel, which actually has a glorious view of the Chicago skyline. As we started our sun salutations, and I modeled raising my eyes to my joined hands overhead, in our line of vision was the barbed wire roof that stood between us and the sky of Chicago. I remember my unfettered ability to see the sky every time I do a sun salutation now. When I teach in studios, I’m aware of our privilege in being able to buy classes, to feel comfortable in a yoga studio, and to end class at our leisure, rather than with a sharp interruption from a guard. I appreciate that many of us are wearing clothing that supports rather than impedes movement. And I am more aware than before of the power of yoga as a practice for those who know they need one. What would you describe as a peak moment in your teaching of the inmates? I think probably my favorite moment was when one of the students, a sometimes-bawdy and always-enthusiastic participant, was stretching in wide-legged forward fold (Prasarita Padottanasana A), experimenting with whether it was possible to deepen into a pose simply by “breathing into it.” Like me, she was from the era of bouncing and re-bounding to deepen a stretch, and we were investigating a whole new way of taking the practice inside. As I watched her, it seemed evident to me that this smartly clowning, often externally oriented woman had found a new and internal reference for her pose. She bobbed up as if from a deep-sea dive, and cried, “I breathed into the pose!” We had big smiles all around. What advice would you share with those hoping to teach in a correctional setting? Teaching in a prison means that you will be subjected and exposed to some part of the trauma of incarceration that inmates experience daily, such as the withholding of information about what is really going on, the lack of control over your time, and the inability to move without supervision. There are also inexplicable barriers to effective communication across departmental lines, the all-too-close scrutiny of how you are dressed and surveillance of what you can carry into the prison, and a culture in which staff members can seem more bent on passing blame than on serving the public. Ensure that you have a way to process some of the emotions that come up, ideally with others teaching in a similar setting. Here in Chicago, the Socially Engaged Yoga Network, a loose collective of yoga teachers involved in social justice work, has been having quarterly gatherings to network and to share experiences and lessons learned. The sense of community with others involved in yoga service work has been invaluable! The Give Back Yoga Foundation is proud to announce the release of “A Woman’s Practice: Healing From the Heart,” produced in partnership with Prison Yoga Project. This 70-page guide offers clear and simple instructions to help women with a history of trauma or addiction to engage in self-healing through a personal yoga practice. This book is available for purchase through GBYF’s online store, and will be offered free of charge to any incarcerated woman who requests a copy through Give Back Yoga. Author Kath Meadows has taught yoga to incarcerated women at the Maryland Correctional Institution for Women and Patuxent Institution in Jessup for nearly five years. Here, we ask Kath about the inspiration behind “A Woman’s Practice,” and about the need for an accessible yoga guide for all women – whether free, or behind bars. GBYF: What inspired you to write A Woman’s Practice: Healing From the Heart? Kath Meadows: Several years ago, I met (Prison Yoga Project founder) James Fox, and I read his book, A Path for Healing and Recovery. I was so moved, especially by seeing the images of men in prison who were practicing yoga. It was taking things beyond the paradigm of Yoga Journal, where we tend to see beautiful women in trendy yoga clothes doing asana. But one thing that struck me was, there were no women pictured in the book. And I can understand why – the images were taken at San Quentin State Prison, a men’s facility. But since the 1970s, there has been an 800% increase in the women’s prison population. And the Department of Corrections has been slow to catch on: it is a sad reality that the correctional paradigm is still largely based on men. For instance, clothing provided for incarcerated women is often available in men’s-only sizing. In my classes, I might see tiny women wearing small men’s T-shirts, and they’re just swimming in them. Most of the support programming provided by the DoC is also based on material designed for men, and it tends to be very confrontational, aimed at breaking through barriers of denial. But that’s not what I saw in my classes. The common issues are low self-esteem and a history of multiple types of abuse and trauma, sometimes including trauma they have visited on others. The sense of guilt is profound. For these women, self-care and self-healing are hugely important. What is your vision for how A Woman’s Practice will be used? My hope is that this book will make yoga more accessible to women who are incarcerated, who are in rehab or live in low-income communities…or just by any woman who feels that a $20 class in a yoga studio with bamboo floors is not for her. I hope this will be an invitation to all women, that this practice is available to them and that every woman has the capacity to engage in her own self-healing. How did you select the images for A Woman’s Practice? This book manuscript was actually written two years ago. The major delay was that I was really set on including images of the women that I teach. Being “seen” is a big part of it – in prison, it’s easy to feel that you have no power at all, that you’re valueless. But the women that I teach were the inspiration for this book, and the force behind it. They had the power to be a very big part of the creative process. That’s why A Woman’s Practice has pictures of inmates practicing yoga and doing meditation and breathing practices. I also wanted to show real women, in real women’s bodies, in such a way that any woman from any background would see this practice as something that they can do. All too often, women who do not fit the Yoga Journal-type imagery feel that they can’t do yoga. I have to say, I was photographed for a section where we needed images, and it was challenging. I have grey hair and I’m 51. I’m not 20-something. I was self-conscious about sharing these photos, and I had to really work hard to let it be OK. But it just reinforced why it was so important to include images of real women. I’m so deeply grateful to the women who were willing to participate in these photo shoots, in a world where there is such pressure to look like an “ideal” woman. And yet, 98% of us don’t look like that. Can you talk about some of the challenges facing your students? The majority of the women in my classes have children, and were the primary caregiver for those children before they were sent to prison. When we incarcerate women, the children are victims, to such an enormous degree. Many of these children don’t have access to their moms – you need a reliable car to get to upstate prisons, since there is no public transportation. But this issue is not on the radar. We incarcerate women and say, “You can’t do anything.” Then we release them into the community with a felony record, so they’re no longer eligible for student loans or Section 8 housing. So many low-income families live in Section 8 housing, and often those who are released from prison can’t return to live with their families because it violates the rules.We render our returning citizens almost incapacitated with the restrictions placed on them. Many people aren’t aware of this, and many aren’t sympathetic to the challenges.There has been a very different sense of the needs of returning veterans. As a country, we may not be doing enough to support them, but there is an awareness of the need and support for the cause. Prisoners are less visible, and there’s less sympathy and support for their needs. How can a yoga practice help women behind bars? Sometimes I look at everything facing my students, and I think, “What is a yoga class going to do for them?” But it is something strong and good and true. Any time we get in touch with the value of our lives, it’s a worthwhile practice. My classes are about women supporting themselves and others in a healthy way, and about telling women, “You are OK. You are worthy.” There is such a sense of pain and distress when we’re being judged unworthy. Of course, if you have committed terrible, violent, cruel acts, the practice of yoga doesn’t erase that. But it does allow you to get closer to the best part of yourself, and that’s always worthwhile. It’s not about denying what you’ve done. It’s about accepting the reality of where you are, and connecting to the best part of yourself. What is the key message you want to pass on through A Woman’s Practice? The most important message I want people to take away from this book – and something I say in every one of my classes – is that we are all born worthy. We may lose faith in ourselves, but we never lose that inner worthiness. It’s our birthright. And no matter what your situation is in life, you’re never nothing. You always have grace that you can bring to the world around you. Help women behind bars to begin their journey of self-healing by purchasing a copy of A Woman’s Practice: Healing From the Heart. For each book sold, Give Back Yoga can fund three free copies of this practice guide for women in prison.